This article is about wildland. For other uses, see The Wilderness and Wilderness (disambiguation). Not to be confused with the bush. The WILD Foundation states that wilderness areas have two dimensions: they must be biologically intact and legally protected. The World Conservation Union (IUCN) classifies wilderness at two levels, Ia (Strict Nature Reserves) and Ib (Wilderness Areas). Activities on the margins of specific wilderness areas, such as fire suppression and the interruption of animal migration also affect the interior of wildernesses. Especially in wealthier, industrialized nations, it has a specific legal meaning as well: as land where development is prohibited by law. 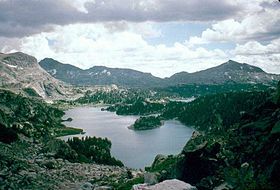 Many nations have designated wilderness, including the United States, Australia, Canada, New Zealand, and South Africa. Many new parks are currently being planned and legally passed by various Parliaments and Legislatures at the urging of dedicated individuals around the globe who believe that "in the end, dedicated, inspired people empowered by effective legislation will ensure that the spirit and services of wilderness will thrive and permeate our society, preserving a world that we are proud to hand over to those who come after us." In 1861, following an intense lobbying by artists (painters), the French Waters and Forests Military Agency set an « artistic reserve » in Fontainebleau State Forest. 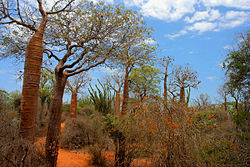 With a total of 1 097 hectares, it is known to be the first World nature reserve. Global conservation became an issue at the time of the dissolution of the British Empire in Africa in the late 1940s. The British established great wildlife preserves there. As before, this interest in conservation had an economic motive: in this case, big game hunting. Nevertheless, this led to growing recognition in the 1950s and the early 1960s of the need to protect large spaces for wildlife conservation worldwide. The World Wildlife Fund (WWF), founded in 1961, grew to be one of the largest conservation organizations in the world. Nevertheless, initiatives for wilderness conservation continue to increase. There are a growing number of projects to protect tropical rainforests through conservation initiatives. There are also large-scale projects to conserve wilderness regions, such as Canada's Boreal Forest Conservation Framework. 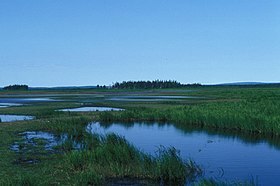 The Framework calls for conservation of 50 percent of the 6,000,000 square kilometres of boreal forest in Canada's north. In addition to the World Wildlife Fund, organizations such as the Wildlife Conservation Society, the WILD Foundation, The Nature Conservancy, Conservation International, The Wilderness Society (United States) and many others are active in such conservation efforts. The World Conservation Union (IUCN) classifies wilderness at two levels, Ia (Strict Nature Preserves) and Ib (Wilderness areas). For the global standard of wilderness (1b) protection, governance and management, read Wilderness Protected Areas: Management Guidelines for IUCN Category 1b Protected Areas. Forty-eight countries have wilderness areas established via legislative designation as IUCN protected area management Category 1b sites that do not overlap with any other IUCN designation. They are: Australia, Austria, Bahamas, Bangladesh, Bermuda, Bosnia and Herzegovina, Botswana, Canada, Cayman Islands, Costa Rica, Croatia, Cuba, Czech Republic, Democratic Republic of Congo, Denmark, Dominican Republic, Equatorial Guinea, Estonia, Finland, French Guyana, Greenland, Iceland, India, Indonesia, Japan, Latvia, Liechtenstein, Luxembourg, Malta, Marshall Islands, Mexico, Mongolia, Nepal, New Zealand, Norway, Northern Mariana Islands, Portugal, Seychelles, Serbia, Singapore, Slovakia, Slovenia, Spain, Sri Lanka, Sweden, Tanzania, United States of America, and Zimbabwe. At publication, there are 2,992 marine and terrestrial wilderness areas registered with the IUCN as solely Category 1b sites. Twenty-two other countries have wilderness areas. These wilderness areas are established via administrative designation or wilderness zones within protected areas. Whereas the above listing contains countries with wilderness exclusively designated as Category 1b sites, some of the below-listed countries contain protected areas with multiple management categories including Category 1b. They are: Argentina, Bhutan, Brazil, Chile, Honduras, Germany, Italy, Kenya, Malaysia, Namibia, Nepal, Pakistan, Panama, Peru, Philippines, the Russian Federation, South Africa, Switzerland, Uganda, Ukraine, the United Kingdom of Great Britain and Northern Ireland, Venezuela, and Zambia. Since 1861, the French Waters and Forests Military Agency (Administration des Eaux et Forêts) put a strong protection on what was called the « artistic reserve » in Fontainebleau State Forest. With a total of 1 097 hectares, it is known to be the first World nature reserve. Then in the 1950s, Integral Biological Reserves (Réserves Biologiques Intégrales, RBI) are dedicated to man free ecosystem evolution, on the contrary of Managed Biological reserves (Réserves Biologiques Dirigées, RBD) where a specific management is applied to conserve vulnerable species or threatened habitats. Integral Biological Reserves occurs in French State Forests or City Forests and are therefore managed by the National Forests Office. In such reserves, all harvests coupe are forbidden excepted exotic species elimination or track safety works to avoid fallen tree risk to visitors (already existing tracks in or on the edge of the reserve). At the end of 2014, there were 60 Integral Biological Reserves in French State Forests for a total area of 111 082 hectares and 10 in City Forests for a total of 2 835 hectares. Due to Russia's size and in comparison non-dense population settlement, as well as of lack of infrastucture and the decades-long iron curtain the country is considered as one of the least explored areas and most natural places in the world. In Western Australia, a Wilderness Area is an area that has a wilderness quality rating of 12 or greater and meets a minimum size threshold of 8,000 hectares in temperate areas or 20,000 hectares in arid and tropical areas. A wilderness area is gazetted under section 62(1)(a) of the Conservation and Land Management Act 1984 by the Minister on any land that is vested in the Conservation Commission of Western Australia. At the forefront of the international wilderness movement has been The WILD Foundation, its founder Ian Player and its network of sister and partner organizations around the globe. 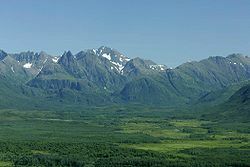 The pioneer World Wilderness Congress in 1977 introduced the wilderness concept as an issue of international importance, and began the process of defining the term in biological and social contexts. Today, this work is continued by many international groups who still look to the World Wilderness Congress as the international venue for wilderness and to The WILD Foundation network for wilderness tools and action. The WILD Foundation also publishes the standard references for wilderness professionals and others involved in the issues: Wilderness Management: Stewardship and Protection of Resources and Values, the International Journal of Wilderness, A Handbook on International Wilderness Law and Policy and Protecting Wild Nature on Native Lands are the backbone of information and management tools for international wilderness issues. The Wilderness Specialist Group within the World Commission on Protected Areas (WTF/WCPA) of the International Union for the Conservation of Nature (IUCN) plays a critical role in defining legal and management guidelines for wilderness at the international level and is also a clearing-house for information on wilderness issues. 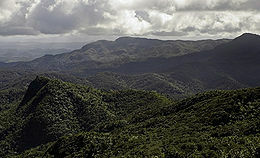 The IUCN Protected Areas Classification System defines wilderness as "A large area of unmodified or slightly modified land, and/or sea retaining its natural character and influence, without permanent or significant habitation, which is protected and managed so as to preserve its natural condition (Category 1b)." The WILD Foundation founded the WTF/WCPA in 2002 and remains co-chair. The most recent efforts to map wilderness show that less than one quarter (~23%) of the world's wilderness area now remains, and that there have been catastrophic declines in wilderness extent over the last two decades. Over 3 million square kilometers (10 percent) of wilderness was converted to human land-uses. The Amazon and Congo rain forests suffered the most loss. Human pressure is starting to extend into almost every corner of the planet. The loss of wilderness could have serious implications for biodiversity conservation. A previous study, Wilderness: Earth's Last Wild Places, carried out by Conservation International, 46% of the world's land mass is wilderness. For purposes of this report, "wilderness" was defined as an area that "has 70% or more of its original vegetation intact, covers at least 10,000 square kilometers (3,900 sq mi) and must have fewer than five people per square kilometer." However, an IUCN/UNEP report published in 2003, found that only 10.9% of the world's land mass is currently a Category 1 Protected Area, that is, either a strict nature reserve (5.5%) or protected wilderness (5.4%). Such areas remain relatively untouched by humans. Of course, there are large tracts of lands in National Parks and other protected areas that would also qualify as wilderness. However, many protected areas have some degree of human modification or activity, so a definitive estimate of true wilderness is difficult. The Wildlife Conservation Society generated a human footprint using a number of indicators, the absence of which indicate wildness: human population density, human access via roads and rivers, human infrastructure for agriculture and settlements and the presence of industrial power (lights visible from space). The society estimates that 26% of the Earth's land mass falls into the category of "Last of the wild." The wildest regions of the world include the Arctic Tundra, the Siberia Taiga, the Amazonia Rainforest, the Tibetan Plateau, the Australia Outback and deserts such as the Sahara, and the Gobi. However, from the 1970s, numerous geoglyphs have been discovered on deforested land in the Amazon rainforest, leading to claims about Pre-Columbian civilizations. The BBC's Unnatural Histories claimed that the Amazon rainforest, rather than being a pristine wilderness, has been shaped by man for at least 11,000 years through practices such as forest gardening and terra preta. 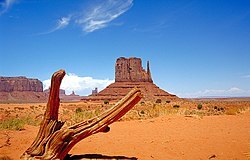 Coming from a different direction, some criticism from the Deep Ecology movement argues against conflating "wilderness" with "wilderness reservations", viewing the latter term as an oxymoron that, by allowing the law as a human construct to define nature, unavoidably voids the very freedom and independence of human control that defines wilderness. True wilderness requires the ability of life to undergo speciation with as little interference from humanity as possible. Anthropologist and scholar on wilderness Layla Abdel-Rahim argues that it is necessary to understand the principles that govern the economies of mutual aid and diversification in wilderness from a non-anthropocentric perspective. ^ "What is a Wilderness Area". The WILD Foundation. Archived from the original on 4 December 2012. Retrieved 20 February 2009. ^ "WHAT IS WILDLAND? - a review". Retrieved 14 July 2009. ^ Canadian Boreal Initiative Boreal Forest Conservation Framework Archived 8 December 2007 at the Wayback Machine. www.borealcanada.ca Retrieved on: 1 December 2007. ^ "The Magic of Yellowstone". Congressional Acts Pertaining to Yellowstone. Retrieved 7 December 2011. ^ New South Wales National Parks & Wildlife Service, "Parks & Reserves: Royal National Park" Archived 20 August 2006 at the Wayback Machine. Accessed 6 December 2011. ^ John Barry; E. Gene Frankland (2002). International Encyclopedia of Environmental Politics. Routledge. p. 161. ISBN 9780415202855. ^ Young, Raymond A. (1982). Introduction to Forest Science. John Wiley & Sons. pp. 20–21. ISBN 978-0-471-06438--1. ^ Wilderness protected areas | IUCN Library System. portals.iucn.org. ISBN 9782831718170. Retrieved 22 March 2017. ^ a b "The World Database on Protected Areas (WDPA)". IUCN and UNEP-WCMC. 2016. ^ "The Unexplored Parts of Europe and Asia". Nature. 24 (614): 312–313. August 1881. doi:10.1038/024312a0. ISSN 0028-0836. ^ "12 Of The Least Explored Frontiers On Earth". TheRichest. 11 November 2014. Retrieved 28 September 2018. ^ "The last unexplored places on Earth". The Telegraph. Retrieved 28 September 2018. ^ "Wilderness Areas". New Zealand Tramper. Retrieved 28 November 2018. ^ New Zealand Government (1987). "Conservation Act 1987 Part 4, Section 20". New Zealand Government. Retrieved 2 October 2008. ^ Malloy, Les. "Specially protected areas". Te Ara - the Encyclopedia of New Zealand. Retrieved 2 October 2008. ^ "Wilderness Act of 1964". Wilderness.net. Retrieved 7 December 2011. ^ "Aldo Leopold". Prominent Figures in Wilderness History. Retrieved 7 December 2011. ^ Department of Conservation and Land Management Policy Statement No 62, Identification and management of Wilderness and surrounding areas. ^ "Wilderness". IUCN. 8 February 2016. Retrieved 22 March 2017. 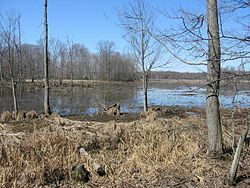 ^ Conservation International (2002) Global Analysis Finds Nearly Half The Earth Is Still Wilderness. Retrieved on 06 Nov 2017. ^ Simon Romero (14 January 2012). "Once Hidden by Forest, Carvings in Land Attest to Amazon's Lost World". The New York Times. ^ Martti Pärssinen; Denise Schaan & Alceu Ranzi (2009). "Pre-Columbian geometric earthworks in the upper Purús: a complex society in western Amazonia". Antiquity. 83 (322): 1084–1095. doi:10.1017/S0003598X00099373. ^ Durrant, Jeffrey O. (2007). Struggle over Utah's San Rafael Swell: Wilderness, National Conservation Areas, and National Monuments. University of Arizona Press. p. 43. ISBN 978-0-8165-2669-7. ^ Thomas Birch (1995). George Sessions (ed.). Deep Ecology for the 21st Century. Boston: Shambhala. pp. 345, 339–355. ISBN 978-1-57062-049-2. ^ George Sessions (1995). Deep Ecology for the 21st Century. Boston: Shambhala. pp. 323, 323–330. ISBN 978-1-57062-049-2. ^ Layla AbdelRahim (2015). Children's Literature, Domestication, and Social Foundation: Narratives of Civilization and Wilderness. New York: Routledge. ISBN 978-0-415-66110-2. 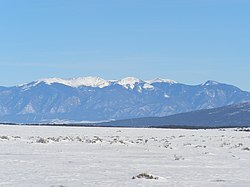 Look up wilderness in Wiktionary, the free dictionary. Campaign for America's Wilderness "American Wilderness Philosophy". Internet Encyclopedia of Philosophy.